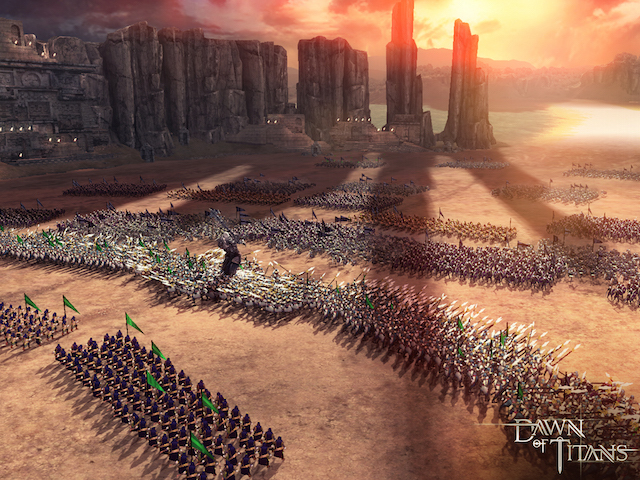 The mobile game will take players into battles containing thousands of on-screen units. During its most recent earnings call, social games company Zynga announced Dawn of Titans, the next game from its NaturalMotion studio, creator of Clumsy Ninja and CSR Racing. The action strategy title is expected to release later this year, and the NaturalMotion team has released some new info about the game to whet our appetite before its release. In Dawn of Titans, players will dive into a fantasy world where they’ll lead super units known as Titans into battles containing thousands of other soldiers, including archers, pikemen and more. Players will build a kingdom to support their forces, and will wage battles to capture new territory. Our team has designed every element of Dawn of Titans – from the trees, to the waterfalls, to the Titans, to the battles – to push the edge and create an entertainment experience that we believe supersedes anything found today in the Action Strategy category. Dawn of Titans uses Echo, a proprietary engine, to support the presentation of thousands of on-screen units simultaneously, while still running smoothly on mobile devices. During battle, players will swipe their finger on groups of secondary units to direct their attack paths, while Titans stand high and above the rest, as large, dominant forces. NaturalMotion’s Morpheme animation engine helps Titans and troops animate with lifelike movements, all with the goal of wowing players. Dawn of Titans will feature both single-player and multiplayer gameplay, including PvP battles and alliances. As we have said before, the winning aspiration for Zynga and NaturalMotion is to be the at-scale industry leader, delivering more hits across more categories than the competition. Given the popularity of the mobile Action Strategy category with consumers, we are excited by the opportunity to redefine what players expect from a mobile Action Strategy game. Dawn of Titans will soon enter the first of many geo-lock testing phases, which will see the developer gauging player feedback in these limited territories as it prepares for the worldwide release later this year. Check back soon for more.